The Kruse LTC is implemented in compression-ignition, direct injection engines by extending current designs to inject fuel in variable quantities during the compression stroke, at the point of ignition and during the power stroke. 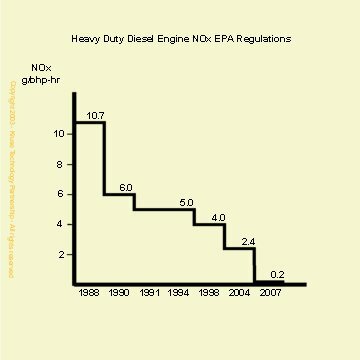 As may be seen from the charts below, ever more stringent diesel engine emission regulations throughout the United States and Europe have put increasing pressure on truck engine manufacturers to meet the statutes, yet still provide vehicle operators with the power and economy necessary to run their fleets. 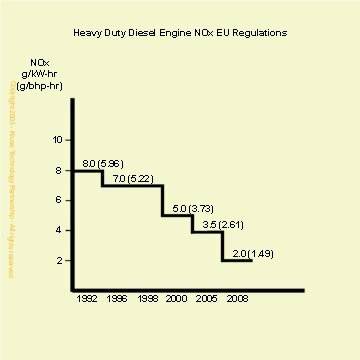 Although huge strides in the reduction of NOx emission levels have been made in the last ten years with the introduction of electronic injector control and diesel emission reduction catalysts, similar magnitudes of improvement have to be attained to meet regulations over the next five years. However, these improvements have to be accomplished without major deviations from current engine technology, in order to ensure that basic engine reliability and longevity are not compromised. They also have to be implemented in such a way that they are sustainable for the life of the engine. This means that the changes have to be evolutionary, not revolutionary, and have to be made at an affordable cost. More sophisticated NOx catalysts and converters provide part of the answer, but with the magnitude of reduction required to comply in 2008, it's believed that they will not alone be able to meet statutory requirements at an economic end-user price without an accompanying reduction in NOx creation during the combustion process. It's therefore believed that the most effective solution will be a combination of the Kruse Limited Temperature Cycle followed by suitable after treatments to remove the remainder of the pollutants. The Engine Cycle Analysis charts below compare a standard Diesel cycle with a Limited Temperature Cycle process with an 18:1 compression ratio and 1 bar of turbo-boost. The main point to note is that while the peak combustion temperature for the LTC process is more than 1,000R lower than that of the Diesel process, the levels of power and efficiency are the same. The implementation of LTC therefore makes it possible to achieve significant engine-out reductions in the creation of NOx, without the trade-offs normally associated with emission control. A comparison of the Temperature-Volume and Temperature-Entropy charts for the Diesel and Diesel-LT cycles generated from the data above, graphically illustrates the reduction in temperature and the isothermal process that takes place with LTC. It should be noted that the above data is formulated on the ideal air standard for both Diesel and Limited Temperature cycles and does not include real world engine losses, which would result in lower actual peak temperatures. However, as the losses would be approximately the same for similar engine configurations, the data is presented as a reasonable comparison between the two cycles.